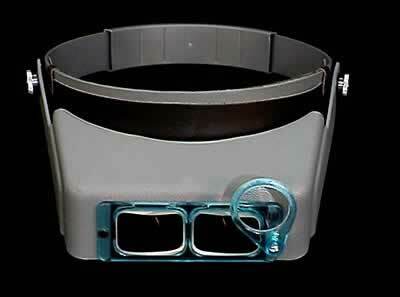 Features a dial adjustmement headband to fit any head size. 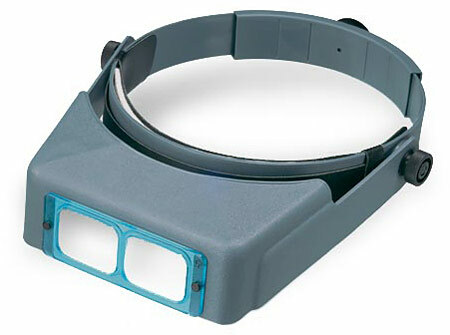 Well made magnifier, lightweight and durable. 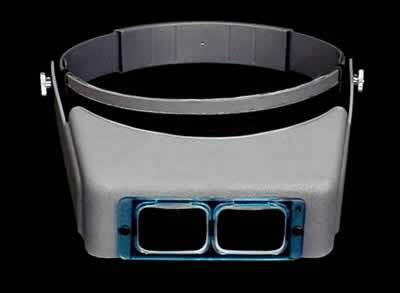 Fits over eyeglasses and the adjustable pivot assembly on the visor can be set to desired tension, so it will stay in place when tilted. 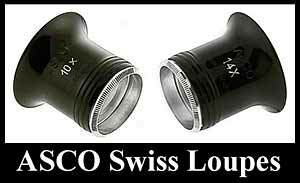 Lenses are ground and polished prismatic type. 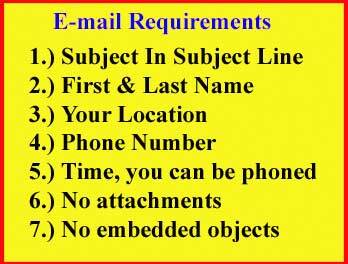 This is the industry standard and is use all over the world, don't be fooled by cheap copies. Shown with the optional "Optiloupe" accessory number FB-631 not included, which will add 2 1/2 power to any Optivisor. The "Optiloupe" will add 2 1/2 power to any Optivisor. Swings out of the away when not in use. A super bright triple LED light and four different power interchangeable lens plates makes this a must have tool. 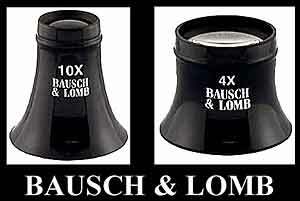 Comes with four clearly marked lens plates, 1.5X, 2.0X, 2.5X, and 3.0X that easily snap on and off. Center positioned swivel LED lamp gives pinpoint lighting in hard-to-see situations (runs on three AAA batteries - not included). As a bonus, the removable LED lamp with magnetic base can be used as a free-standing light source. 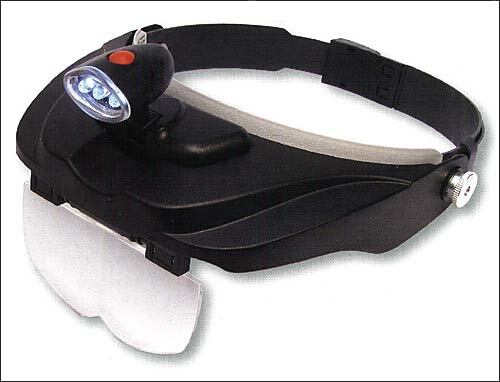 This is the ultimate in lighted headband magnifiers. Now you finally have the power you need available and the extra light right where you need. 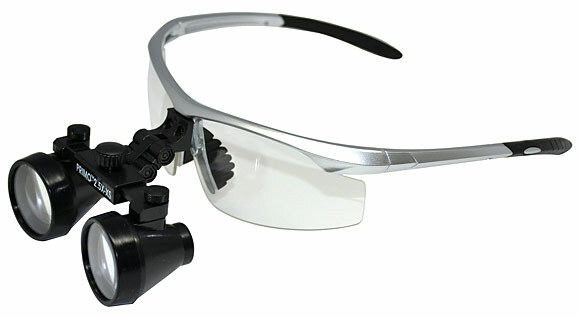 These economical setter's safety glasses deliver high quality optics and durability. 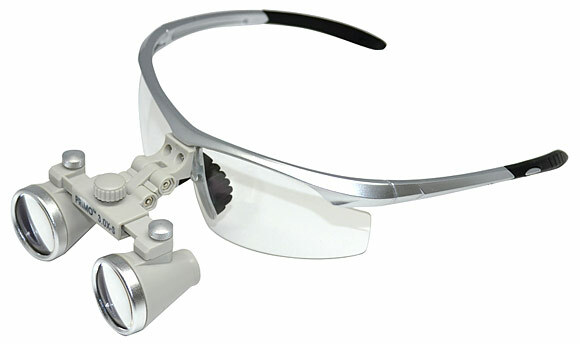 Both eyepieces are mounted on an attractive eyeglass frame that offers additional safety from small particles, debris, and dust from the setter's bench activities. 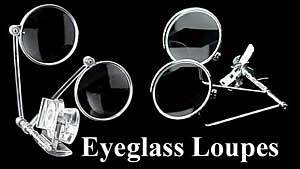 The safety glasses are supplied in a handy carry case, along with a polishing cloth to clean the Optics, and a convenient cord to hold the glasses around your neck. Magnification: 3.0X. Working Distance: 11" - 15". 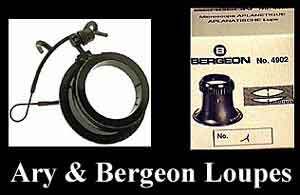 Field View: 2.75"
Magnification: 2.5X. Working Distance: 11" - 15". Field View: 3.75"